While I do love chocolate, I always felt that a chocolate pie took things a bit too far. I do have my limits. However, a mini chocolate pie tart that I can pop in my mouth is just fine by my stomach and me. In moderation, of course. This decadent recipe featuring caramel, chocolate ganache, dark, and sea salt comes from Ghirardelli via BlogsRelease. Heat heavy cream in a small saucepan set over medium low heat until hot and just starting to bubble. Place 4 ounces of the bittersweet baking chips in a medium sized bowl and pour cream over the chips. Cover the bowl with a plate and allow to sit for about 5 minutes. Whisk chocolate and cream together until chocolate is completely melted and mixture is smooth. Allow ganache to sit for about 10 minutes. 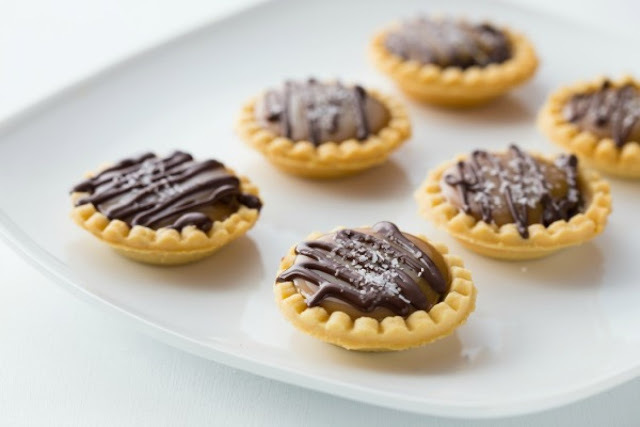 Scoop 1/2 teaspoon of ganache into each pie shell and allow to sit at room temperature until chocolate is set. Add cream and butter to a small saucepan set over medium heat and stir until butter is melted and cream is warm. Cover and remove from heat. Add sugar, corn syrup and water to a heavy bottomed saucepan (at least 6 cup capacity) and stir to combine. Attach a candy thermometer to the side of the pot so that the tip of the thermometer is submerged into the sugar mixture, but not touching the bottom of the pan. Set the pan over medium high heat, stirring the mixture until the sugar dissolves. Once the sugar dissolves, stop stirring and allow mixture to bubble until the temperature reaches 350 degrees. The color of the sugar will very quickly turn dark amber toward the end of cooking. Once the temperature reaches 350, remove from heat and gently pour in the cream and butter mixture. The caramel will bubble up furiously and then settle a bit. Once mixture has settled a bit, stir with a heat-proof spatula or wooden spoon. Add vanilla extract and salt and continue stirring until caramel is smooth and even in color. Allow caramel to set for about 5 minutes. Place remaining bittersweet baking chips in a microwave safe bowl. Microwave on 50% power for 30 seconds and stir. Repeat heating steps until chocolate is melted. Transfer to a zip top bag and snip off a very small amount of one corner, creating a fine piping bag. Drizzle melted chocolate over caramel. Sprinkle with salt. Allow chocolate to harden and serve. Use store bought caramels in place of the homemade caramel for a quick alternative. Add 1 teaspoon of water and microwave on high for 30 seconds. Stir and repeat heating until caramel is melted. Allow caramel to sit for 1 minute. Scoop 1/2 teaspoons of caramel on top of each mini pie.